Underworld: The Rise of the Lycans is pointless stand-alone prequel to the first two films in this franchise. It's hard to know where to begin with the criticism, but let's start with the digital video images: they're blurry. Also, the fight scenes messy, the editing is jerky, and the corny plot absurdly overwrought. 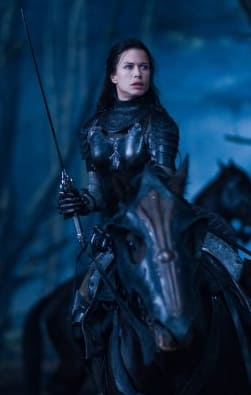 The movie - which takes places 100 year before the death of Michael Sheen’s love-struck Lycan at the end of Underworld: Evolution - relies far too much on ridiculous bursts of bloodletting and poor CGI effects. We guess we can give credit to Bill Nighy, Sheen and and Stephen Macintosh as the quietly effective Tannis. But everything else in the film is a mess.